Vitamins are not only for your body, explains Joel Schlessinger MD. Many individuals do not think about vitamins outside of their diet or daily multivitamin tablet. These powerful ingredients, however, are becoming more and more common in skin care products. In this presentation, Joel Schlessinger MD explains the benefits of these ingredients and recommends his favorite vitamin products. Used for their antioxidant and skin renewal powers, vitamins can help strengthen and repair your complexion. A vitamin serum, gel or cream has the power to protect against damage and reveal a more youthful complexion. Vitamins are most often used for their antioxidant properties, says Joel Schlessinger MD. Anytime you purchase a product with vitamins A, C, D or E in it, you will be receiving protection against free radicals. Free radicals are environmental stressors that cause signs of aging including dark spots, fine lines and wrinkles. The most powerful of these, vitamin E, neutralizes free radicals to minimize signs of damage. Serums such as SkinCeuticals C E Ferulic defend the complexion to maintain a youthful appearance. Another advanced ingredient found in many skin care products is vitamin D. Serums such as Dr. Dennis Gross Skincare Active Vitamin D Serum Oil protect the complexion and nourish skin to create a healthy glow. According to Joel Schlessinger MD, you can also use vitamins to minimize signs of aging. Ingredients such as vitamin C help diminish signs of aging by stimulating collagen. Highly concentrated serums like Obagi Professional-C Serum 10% increase collagen synthesis to fill in fine lines and wrinkles. One of the most common anti-aging ingredients, retinol, is derived from vitamin A. Vitamin A, found in products such as SkinMedica Tri-Retinol Complex ES, encourages cell renewal to fade multiple signs of aging. Do you have questions or comments about these skin care ingredients? Let us know below! Taking notes from history, researchers are studying natural and safe ways to eliminate the common bed bug problem. 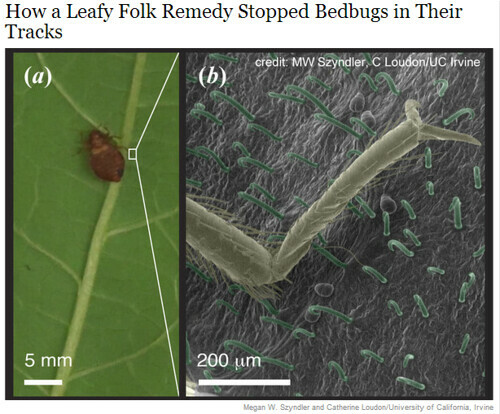 The article “How a Leafy Folk Remedy Stopped Bedbugs in Their Tracks” recently published in the New York Times discusses one study that may remove the need to use harsh chemicals when dealing with bed bugs. Researchers are attempting to replicate an old European technique where women would cover the floors of infested rooms with bean leaves. The unique texture of the bean leaves would hook onto protrusions on the bed bugs outer shells to prevent them from escaping. Research such as this, explains Dr. Joel Schlessinger, highlights the importance of studying history when conducting new research. Historically, bed bugs are a common problem that cause rashes and other allergic reactions, explains Dr. Joel Schlessinger. Bed bugs dwell in dark, confined places and they often cause allergic reactions that can itch or become irritated. Traditionally, bed bugs are treated using a combination of chemicals and pesticides that can have drastic effects on an individual’s health and the environment. Research into a natural and safe alternative, such as replicating the bean leaf technique, is an important area to study. “This is a natural, chemical-free and pesticide-free way to treat the problem, as opposed to the alternative, DDT, which nearly killed off an entire species,” says Dr. Joel Schlessinger. Learning to replicate historical techniques is an excellent way to develop technology today, says Dr. Joel Schlessinger. Scientists are continuing to study the effectiveness of the bean leaf technique and how it can be replicated today. Because bed bugs are developing a resistance to pesticides, it is becoming increasingly important to eliminate the need for harsh chemicals. Joel Schlessinger MD recommends Tanda skin care devices, now available at LovelySkin.com. Technological advances in the skin care industry allow individuals to receive professional-grade treatments in the comfort of their own homes. Tanda, a line specializing in skin care devices, has created several anti-aging and acne tools that create a healthier complexion. In this presentation, Joel Schlessinger MD highlights a few of these products. Each of these tools uses the latest technology in light therapy to produce visible skin-clearing results. Joel Schlessinger MD suggests Tanda Luxe to minimize fine lines and wrinkles. This anti-aging device is FDA-cleared and clinically proven to restore and rejuvenate a mature complexion. Tanda Luxe uses red light therapy to boost collagen and elastin production, providing you with a firmer and tighter complexion. This device smooths the appearance of fine lines and wrinkles while rejuvenating the skin to create a more youthful appearance. Using this light therapy device for 12 minutes, twice a week promotes a softer and smoother complexion after a few weeks. Many individuals who use this device experience a visible improvement in their complexion after only one week of treatment. 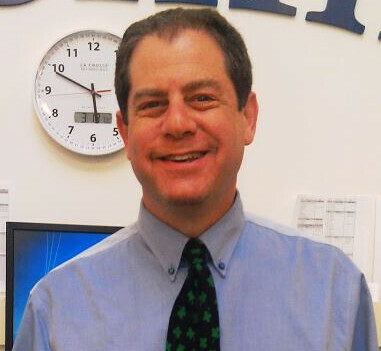 To treat acne, Joel Schlessinger MD advises using the Tanda acne devices. Tanda Clear is a must-have product for treating mild to moderate acne. This tool uses blue light therapy to kill P. acnes bacteria, which aggravates the complexion and causes breakouts. Glide this blue light therapy device over your complexion for three minutes, twice a day and experience fewer breakouts. For pimples that pop up unexpectedly, use Tanda ZAP. This handy tool uses blue light therapy, sonic vibrations and a gentle warming sensation to eliminate bacteria and calm inflammation. You can use this device up to three times a day to treat pimples without dryness, redness or irritation. Look for more presentations from Joel Schlessinger MD here. Stem cell research is a buzz word in the medical field that has now crossed over into the skin care industry. The article “The Debate Over Stem-Cell Face-Lifts” in a recent issue of the New York Times discusses a new procedure that uses stem cells to regenerate an aging complexion. The article includes several opinions from top dermatologists and cosmetic surgeons on the topic. While many people are eager to try this new procedure, there are still some doubts among dermatologists, including Joel Schlessinger MD, about the effectiveness of this treatment. Unlike traditional face lifts, explains Joel Schlessinger MD, a stem cell face lift is a non-surgical procedure. During a traditional face lift, the skin is cut and lifted to improve the appearance of a sagging and loose complexion. A stem cell face lift is a non-surgical procedure, similar to fat grafting, during which fat cells are injected into the skin to restore lost volume. This procedure can be used to revitalize thin areas such as the hollows of cheeks and the under-eye area. The cells used during this procedure are taken from areas that have excess fat cells such as the stomach or thighs. 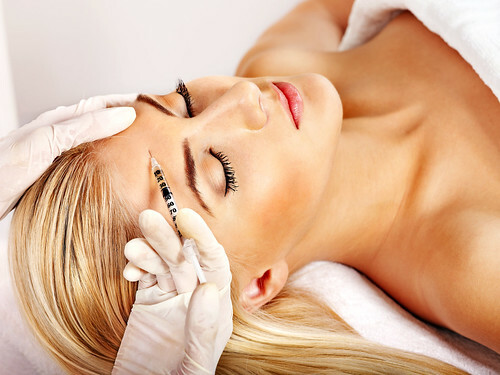 Stem cells are then added to the injections to help regenerate fat cells and plump the thinning areas of the face. Joel Schlessinger MD recommends caution when deciding whether to undergo this procedure. Most dermatologists, including Joel Schlessinger MD, are attaching a “buyer beware” condition to this procedure. Because this process is still relatively new, there is very little conclusive evidence that proves this procedure works. Physicians also warn against clinics and businesses that use the phrase “stem cell face lift” as a marketing gimmick without supplying evidence to back up their claims. Until clinical studies and trials are conducted, patients should approach this treatment with caution. Have you heard about or received this new procedure? Tell us about your experience in the comments below. Treating yeast-based acne is different than treating other types of acne, explains Joel Schlessinger MD. Acne treatment products are not designed as “one size fits all.” Everything from hormone changes, yeast infections, stress and diet can contribute to acne symptoms. Because every case has a different cause, each individual must be treated a certain way. In this video, Joel Schlessinger MD discusses a common yet often times unknown type of acne known as pityrosporum folliculitis, or yeast-based acne. He also highlights the treatment options for this type of acne. What is yeast-based acne? Joel Schlessinger MD explains. Pityrosporum folliculitis is caused by a yeast infection and appears as tiny red bumps on the skin. These bumps are often itchy and can become irritated easily. This type of acne generally begins to form on the forehead and face and continues to spread to the neck, chest and back areas. Sweat, heat and wearing clothes that are not breathable may cause this condition to worsen in areas such as the back and chest. Many people attempt to treat this condition using traditional acne products and do not experience any improvement in their symptoms. Joel Schlessinger MD highlights both topical and oral treatments for yeast-based acne. Treatment products that contain benzoyl peroxide or salicylic acid will not effectively treat yeast-based acne. Instead, Joel Schlessinger MD recommends topical anti-fungal products such as Nizoral to his patients. This cleanser can be used to wash the face and body to treat the yeast infection. Patients can also take the oral medication Ketoconazole that helps eliminate the infection to reduce the appearance of acne symptoms. If traditional acne products are not working on your blemishes, consult a physician to determine whether or not you have developed pityrosporum folliculitis. Watch more videos from Joel Schlessinger MD on his YouTube channel. It’s no secret that drug prices are astronomical. We see prescriptions that range from $150 to $1200 for pills or topically applied medications and there are even more expensive ones for certain psoriasis medications! Medication prices vary greatly and it is amazing for me to see as a dermatologist the variations between pharmacies. In my dermatology practice I recommend my patients check prices frequently, especially on expensive medications. As the article states, Costco is king right now, but we find that Sam’s, Costco and Walmart are typically the least expensive pharmacies in our area, but it may be different where you live. Generally, Walgreens and CVS are convenient, but you pay a huge price for that convenience. One other thing to note is that generics, although often less expensive, don’t always perform as well as brand name drugs. Also, sadly, the savings for generics seem to be evaporating as pharmacies are offering less and less of a discount on them and keeping the difference as profit. We offer our very own FixMySkin 1% hydrocortisone lip and body balm to our eczema, psoriasis, cracked fingers and chapped lip patients for $8 to $12 and the alternative as a prescription in pharmacies is anywhere from $30 to $120 and no better at all (and sometimes worse)! You may want to consider that if you have one of these conditions and are tired of expensive creams that don’t work. You can find it at www.LovelySkin.com/FixMySkin. Lastly, when you are at your dermatologist’s office, always ask if they are prescribing a generic or brand name drug. If they are prescribing a brand name drug, ask them if there is a coupon for it as most drug companies offer a coupon of some sort for their medications that will decrease the costs significantly. It never hurts to ask and it can sometimes save you hundreds of dollars! In an article titled “Temporary Tattoos May Put You at Risk,” the FDA recently reported that a chemical found in black henna tattoos could cause allergic reactions. Traditional henna, which is reddish-brown in color, originates from a flowering plant found in tropical and subtropical regions of Africa, southern Asia and northern Australia. It has been used to dye hair, skin and fingernails for centuries. But black henna is a different story. It may include coal-tar hair dye containing p-phenylenediamine (PPD), an ingredient that can cause dangerous skin reactions in some people. The side effects of these temporary tattoos can be treated, but permanent scarring is sometimes unavoidable. Dr. Joel Schlessinger explains. 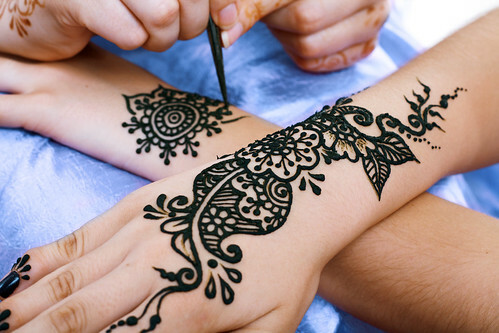 Allergic reactions to black henna can occur immediately after application or as long as two to three weeks later. The FDA has received consumer reports of these temporary tattoos causing blisters, redness, loss of pigmentation, “raised, red weeping lesions” and an increased sensitivity to sunlight. Dr. Joel Schlessinger says these symptoms are often treated with topical steroids, oral steroids or antihistamines. In some cases, patients with severe allergic reactions can develop permanent scarring. Avoid temporary tattoos, Dr. Joel Schlessinger says, especially those offered by kiosks found in popular travel destinations. PPD is banned in cosmetics and the Department of Public Health regulates parlors that provide permanent tattoos, but many states don’t have official standards for temporary tattoos. Without proper regulation, this dangerous chemical has been found in kiosks on beaches, boardwalks and foreign resorts. One way to avoid these dangerous skin reactions is to consider the product. Traditional henna usually fades within a few days. When kiosks promise darker, longer-lasting temporary tattoos, Dr. Joel Schlessinger says this is a sign they could be using black henna. The best way to stay safe, he says, is to complete avoid temporary tattoos of any kind. Have you had a bad experience with temporary tattoos? Let us know in the comments. What causes bruising? Joel Schlessinger MD answers this question and more. Many of us do not think twice when we notice a bruise on our arms or legs. When a bruise appears on our face, however, we often look for ways to heal and diminish the mark more quickly. In this presentation, Joel Schlessinger MD describes what products can help prevent and diminish the appearance of bruises. Bruising is caused when blood vessels beneath the skin become weak or damaged. This causes blood to pool beneath the surface and a blue or black mark to appear. Bruises are common in men, women and children of all ages and may be tender or sensitive until they fade. According to Joel Schlessinger MD, bruising can occur following certain cosmetic procedures. While many people develop bruises after falling or bumping into something, bruises can also be caused by cosmetic procedures such as fillers, injections and laser therapy treatments. The skin on the face is thinner and more delicate than other areas of the body so bruises are more likely to develop on the complexion. Maintaining strong and healthy skin may help reduce the likelihood and degree of bruising. A diet that is rich in vitamins and minerals and a skin care regimen that includes sunscreen can help you maintain a healthy complexion. Joel Schlessinger MD reveals his top product picks for healing bruises. Products that contain vitamin K such as LovelySkin Vitamin K Crème and Auriderm Post-Op Gel strengthen capillaries to prevent and fade the appearance of bruises. You can also reduce the risk of bruising before undergoing a cosmetic treatment by applying products such as Neocutis PREVedem Antioxidant Serum for several weeks prior to your appointment. While bruises are healing, cover them with a foundation such as DermaBlend Professional Cover Cream SPF 30 to protect against sun damage. Watch this presentation to learn about other products you can use and how to avoid this common skin concern. Retinol, reveals Joel Schlessinger MD, is one of the most effective anti-aging ingredients available. Retinol is an ingredient that is becoming more and more popular within the skin care industry. This ingredient is a derivative of vitamin A and is used to reduce the signs of aging. In this video, Joel Schlessinger MD highlights his favorite retinol products and how to incorporate these formulas into your regimen. Retinol is used in anti-aging products to encourage cell renewal and rejuvenate the complexion. Applying a retinol product daily minimizes the appearance of fine lines and wrinkles, fades discoloration and softens a rough or uneven texture. What is the difference between retinol and Retin-A? Joel Schlessinger MD explains. Retin-A is a powerful form of vitamin A that is only available with a prescription. Retinol is a popular alternative to Retin-A because it is gentler, less irritating and is available over the counter. For patients who do not have a prescription for Retin-A, products that contain retinol are an excellent alternative. While they will not experience results that are quite as dramatic, they will still achieve noticeable smoothing and renewing effects. Because this ingredient causes dramatic skin renewal, it is important to always wear a broad spectrum sunscreen while on a retinol regimen. This will protect against serious UV damage and irritation. Some individuals may experience redness, flaking or irritation after applying retinol products, which disappears quickly. Joel Schlessinger MD recommends his favorite retinol products. For advanced anti-aging results, Joel Schlessinger MD recommends SkinMedica Tri-Retinol Complex ES, which contains three types of retinol. You can also use LovelySkin Retinol Drops or SkinCeuticals Retinol 1.0 to smooth fine lines and wrinkles and minimize dark spots. Learn about other skin care ingredients and issues by watching videos by Joel Schlessinger MD on his YouTube channel.